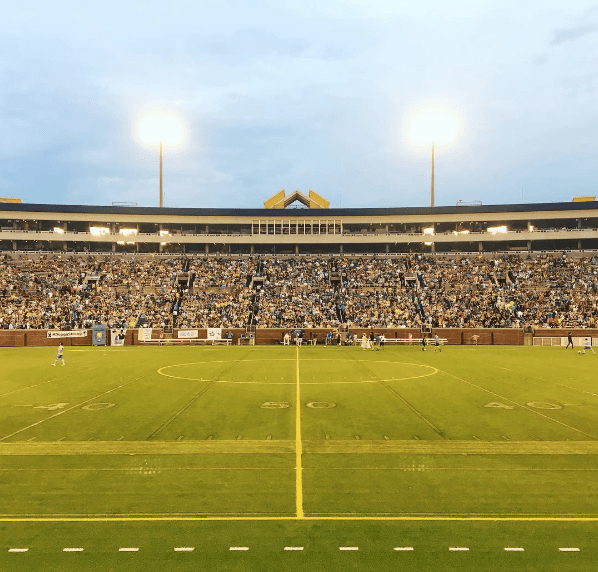 On August 8, 2015, 18,227 people filled Chattanooga’s Finley Stadium to watch their local amateur club, Chattanooga FC of the National Premier Soccer League, face off against New York Cosmos B for the fourth division NPSL national championship. 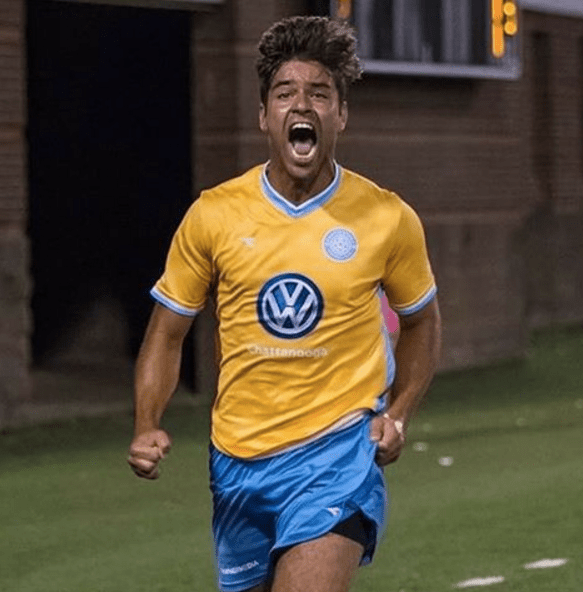 The Cosmos reserves won on the field, but Chattanooga won the day by showing the world that something very special is happening in the southeastern Tennessee city. Chattanooga would make soccer headlines again in November of that year, when at BlazerCon Major League Soccer commissioner Don Garber famously referenced the town in a poor example to explain why he thinks promotion and relegation can’t work in the USA. “If you’re investing billions and billions of dollars, which we are now at about $3.5 billion invested in 20 years, to build something in Kansas City and they have a (bad) season, to think they might be playing in Chattanooga in a stadium of 4,000 people on a crappy field with no fans, makes no sense,” Garber said. To Garber’s credit, he later apologized to Chattanooga FC. However, the incident served as a stark contrast between what Chattanooga FC is accomplishing in a bottoms-up, grassroots community movement versus the top-down investor-driven approach of MLS. Chattanooga FC first got its start in 2009, when a group of friends including Sean McDaniel, Marshall Brock and others wanted to marry their love of soccer with their love of Chattanooga to create something special the city could rally around. Like many places in the Southeastern US, Chattanooga is college football country. It turned out that the National Premier Soccer League’s season ran from May to August, a lull in the town’s sporting calendar. Recently we have seen interesting articles attempting to “open source” the formula for running a successful lower league soccer team. Dennis Crowley, the founder of FourSquare and the NPSL’s Kingston Stockade, provided a detailed breakdown of what went into year one of his club, called “Everything You Ever Wanted to Know About Operating a Division 4 Soccer Club (But Were Afraid to Ask).” The Chairman of the PLA’s Minneapolis City SC, Dan Hoedeman, shared his club’s financials and some of the war stories behind the club’s founding and first year as a soccer startup. 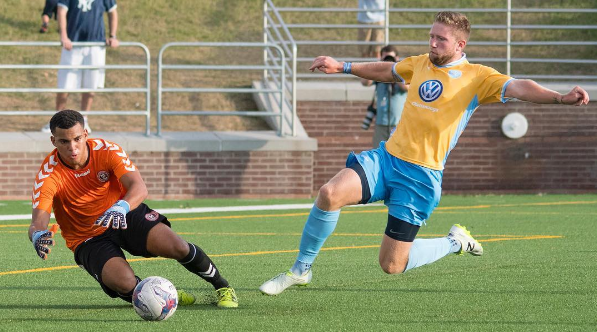 Intrigued by these grassroots efforts, Midfield Press reached out to Sean McDaniel, General Manager of Chattanooga FC, to try to learn something about the secret sauce of one of lower league US club soccer’s biggest success stories. McDaniel was kind enough to share the background on how it all got started, the key elements that drive Chattanooga FC’s success and a look into the club’s plans for future growth. 1. You and your peers have created something very special in Chattanooga. How and why was the team founded? Some friends, most of us went to school and played soccer together, sat down and said we should play soccer together in Finley Stadium. The section of the city that the stadium is in had fallen on hard times. The motivation was to begin to animate the stadium, and help to revive the area. The NPSL was something we just stumbled on. The league was easy to jump into because there were 40 teams. There was actually no foresight and planning. It is miraculous that we made it this far. 2. The attendances have been really remarkable. Chattanooga is a MSA with a population of 550,000. How have you managed to draw crowds over 10,000 on several occasions? What we’re finding when we look at our city and other cities that have this community success factor, there are things that lend itself to it. We play at a stadium where we offer amatuer soccer in a professional environment. It’s sort of an “if you build it they will come” thing. Chattanooga does not have a major league sports team here. We sit far enough away from Nashville and Atlanta that people aren’t really going to go that far regularly. We play in a stadium where we can sell beer, sell food and have a festive atmosphere. That resonated with the city. People go for the experience, and go out later. It’s a fellowship, and it happens at Finley Stadium on Saturday nights in the Summer. Winning helps, but when you show up at a CFC game you show up for the entire experience. That’s what we managed to figure out. 3. What is the average attendance over the course of a season for Chattanooga FC? The good news is that we’ve gone up each season. This year we were up 30%. 2015 was the year we hosted the Cosmos B in the final, and that momentum carried into 2016, which is great. We are averaging about 4000 fans again and hopefully, as we make these playoff runs, that generates another level of interest. 4. What is the supporter culture like in Chattanooga, and can you tell us a little bit about the the team fits in the community? It’s one of those things that you don’t know you have a market for it until you produce the product. The Supporters Group is the shining example of that. The Chattahooligans are as well known as the football club. They are a great group of individuals made of up of lawyers, teachers, pastors, mothers, children… a blend of diversity that come together to celebrate all things Chattanooga at a soccer game. There are those that are very vocal and those that may not get as crazy as the Chattahooligans at a game, but they are all at of it at heart. It is the city’s team. The support is tremendous. The city has changed over the last decade. There’s an European component that has come in with the investment that Volkswagen has made. There is a vibrant tech community. The Chattanooga Football Club is in the right place at the right time to be a melting pot. 5. Do you think the lack of top level professional sports alternatives in the town (there is a AA baseball team) has helped Chattanooga FC really standout in the community as something to rally around? One of the things we recognize is the boundaries within the market. There is no college football being played in the Summer. From May-August, we have an open template where it is truly ours to succeed or fail. We work with the Lookouts (AA baseball team) to schedule in a way where we try not to compete with each other. We share ideas. We promote each other’s brands in games. Rather than fight for the same dollar, let’s grow the pie. If we tried to do this during college football season it would be harder. 6. What is the long term vision for the team? This is what gets asked the most of us. It seems and feels to be the most natural question to ask. There’s this sense that you can’t do more in the NPSL. But we think we can. It is far better for the CFC brand to grow out into the community and beyond. We have started a non-profit foundation that supports programs in the community. We have started an academy. We have started a consulting arm because we want everyone to have a team in their community like Chattanooga FC. Rather than take on the burden of the considerable expense to go up, we want to grow the brand out into the community further. 7. What is the ownership structure of Chattanooga FC? We are a C-corp. There are 9 shareholders. I am the only one who works here full time. All of us owned and operated small businesses in the Chattanooga area. I was in a payroll/HR outsourcing business, another is in wealth management, another is in the car business. We all bring business acumen. We certainly have the net worth to go up to a USL or NASL, but we have not taken on any other investors at the moment because we haven’t felt the need to. 8. One of your local rivals, Nashville FC, is moving up to the pro ranks. Is the club looking at a move to NASL or USL? Any preference between those leagues? To go up a level, we have to really ask ourselves what do we hope to do with this. A lof markets want to move up to try to land an MLS team. Chattanooga is not ever going to have an MLS team. So there is no hurry on our part to go up any levels. Our long term vision is to teach others in other cities how to do this the way we’ve done it so we can all play soccer in front of lots of people in the Summer. We are speaking with Peter Wilt as what we want to do at an amateur club level compliments what he and Club 9 Sports are doing in terms of consulting at the professional level. For a market like Nashville, they are making the right choice. That is a big league sports town. In Chattanooga, it costs $7 to show up to a soccer game. We don’t want to burden the fan by doubling or tripling ticket prices. We don’t want to “forget the date that brought us to the dance”, so to speak. We want to keep the right equation together in terms of cost and value. Going up is something we may consider one day. Right now we want to take the model and keep expanding on it without burdening the fan any further. 9. Don Garber famously cited Chattanooga as an example of why promotion and relegation wouldn’t work for MLS teams, criticizing your stadium in particular. Do you think Finley Stadium could work at a pro level? There’s no question that the stadium could work at a pro level. One of my partners happened to be in the crowd when he said that. I think the rest is soccer folklore history. Mr. Garber called and apologized. It was a comment that was made without much thought to it. The stadium itself is spectacular, and it is a credit to the people who run it. We had the US women’s national team here in August 2015, and it sold out within a few hours. It is the perfect sized stadium for what we are doing and beyond. 10. We have recently seen informative write ups on the financial and operational aspects of successfully running a lower league team by the owners of the Kingston Stockade (NPSL) and Minneapolis City SC (PLA) in an effort to “open source” a soccer success formula to communities around the country. As one of the most successful NPSL teams around, what would be some of the most important aspects of your success formula that you can share with folks looking to start a club like Chattanooga FC in their town? There are a couple key things. The first is to do like Dennis did and put your budget on a spreadsheet. Sit down and do it just as if you were opening a franchise or starting an insurance company. It’s a business. Put all your numbers in a spreadsheet and cash flow it out. I even see this at higher levels too, where they pour money into the organization rather than putting a financial template and plan together. You need to understand how you are going to make a living. As Dennis said, he knew how much he was going to lose in Year One and then work to reduce that in Year Two. Second is really being a part of the community where you play. Do everything you can in your market to play in where there is growing and a vibrant area in the community (in business speak, location, location, location). If you can create an environment that is part of the fabric of a downtown that is a huge part of this. You don’t want to be in the outskirts of town if you can at all help it. It even holds true in MLS. The stadium’s proximity to all things cool to do on a Saturday evening is important to success. Put your product in an area where it becomes part of the cool thing to do and the cool place to be. 11. What else should the readers of Midfield Press know about Chattanooga FC? The thing we want everyone we speak with to know the most is that the Chattanooga Football Club is about the city of Chattanooga. Our vision from Day One – one thing we have been adamant about – is it is the city first. Chattanooga first. We want Chattanooga to be seen by the rest of the world as this awesome place. We want people to want their city to be just like Chattanooga. Soccer is global. To somehow put the name Chattanooga on a global sport was what we wanted from day. Now people look around and they say I want to know what’s going on in Chattanooga. The world now knows and continues to know how great this city is. We want people to love this city like we love it. So far so good! A big thank you to Sean for taking the time to answer our questions, and look for more “XI Questions With…” lower divisions teams in the future.